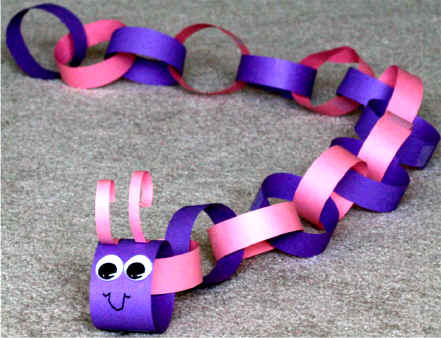 This is a fun, simple craft for all ages (even daddy has fun trying to make the longest caterpillar). It's also a good project for practicing making patterns. Cut about 15 strips of construction paper 1 inch wide and 10 inches long. Cut one last strip of construction paper 2 inches wide and 10 inches long -- this will be the head (it needs to be a bit wider, so we can fit the face on). 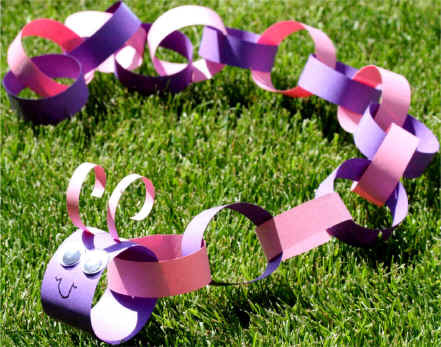 Slide the head strip through the last ring on your paper chain and make it into a ring.